Charging the Earth - Solar! : More about electrical storage - NiCads! 8 July 2012: Last weekend, I had the pleasure of talking to my wife's first cousin's husband. we were at a family re-union of about ninety people! He's called Simon, and he lives on a remote island in the Orkneys, completely off-grid. He owns the island and a herd of special sheep, cultured to eat seaweed. 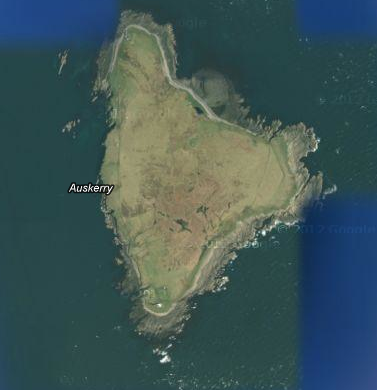 When the tide goes out the island is nearly doubled in size, and over time the sheep have become used to the briny diet. They graze on the foreshore during low tide. He brings in gas bottles for cooking, and has a back up diesel generator, but prefers to get his power from a number of small wind turbines, chargin batteries. There is one thing his island has, all the time, day and night, and that is wind! There is a lighthouse at the southern tip of the same island, and that is nearly self supporting too, with back up of diesel, of course. Their batteries are large industrial NiCads, of the sort that commercial buildings use as backup systems for emergency lighting an power. NiCads of this sort can survive going completely flat, they can survive thousands of recharge cycles, survive freezing or sweltering temperatures, and cope with the sort of intermittency that you get with wind or solar. Even a cloud going across the sun would cause intermittency, and they can cope with that easily. They are far more expensive than a lead-acid battery, but have far longer life. Large property owners such as supermarkets, hospitals and universities have to replace their NiCads at intervals, for maintenance reasons, and a second hand one is perfectly good enough for the demands of a domestic property. Simon manages very well with second hand NiCads from the lighthouse. Looking again at Lead Acid, one has to get a deep charge battery of the sort used on Caravans or Boats - which are good for general power needs and not needing the explosive power of a car battery that has to operate a starter motor. Even the best of these have a limited lifetime of the number of cycles. I shall probably end up getting one of these, as they are much cheaper than NiCad. But I shall make an effort to get a second hand NiCad. NiCads for industrial use some in all sizes. 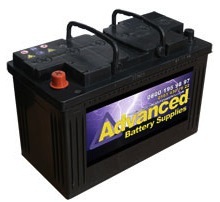 There are many suppliers of deep charge lead acid such as Advanced Battery Supplies. For the industrial NiCads, there are fewer options. 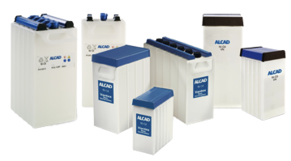 However, I was recommended to try ALCAD, who include NiCads suited for solar applications. Ive requested a quote, but am still waiting for a reply. I have a feeling that they are MUCH more expensive than Lead Acid, so I hope I can ask for a reconditioned or second hand one. I might even consider going to ASDA or Marks and Spencer and ask if their batteries are due for replacement. 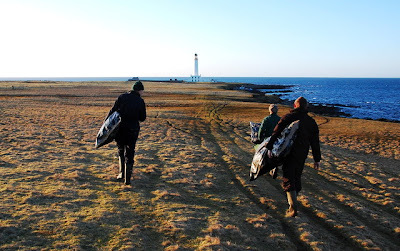 Teresa, Simon and Hamish carrying cured fleeces to be taken to Kirkwall on the MV Enbarr. Simon stayed behind alone on Auskerry. The rest of the family will return in the summer. The lighthouse is visible at the south end.